Thomas Yohe played three years of varsity football at Harvard and played his way into Crimson quarterback history. Yohe holds the seventh-best mark in career total offense racking up 845 attempts and 4,370 yds in three years. He also ranks 11th for single season total offense (417 attempts, 1,982 yards in 1987) and 10th for single-game total offense (45 attempts, 363 yards vs. Massachusetts). Yohe currently ranks fourth in career passing, completing 320 passes in 648 attempts for 4,407 total yards and 30 touchdowns. His 30 career passing touchdowns also ranks fourth in Crimson history. Yohe is tied for second for touchdowns in a single season throwing 17 in 1987. 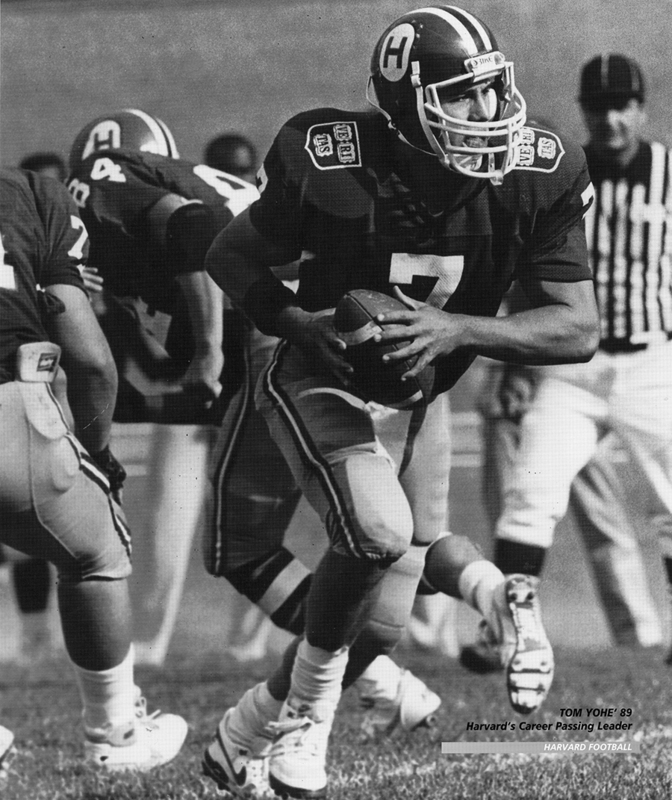 His 1987 season also places him fourth in single season passing, with 158 completions on 321 attempts amassing 2,134 yards as well as set the record for most attempts in a single game throwing 52 at Holy Cross and has the second highest mark in attempts in a season. Not an entirely strange conversation to have on the streets of Cambridge or New Haven I would imagine. Especially back in the day. But since it took place on the balcony of a restaurant overlooking a glorious sunset in Monteverde, Costa Rica this past January, with an 73-year old Yale alumni who I had coincidentally just met moments before, it was truly special. In much the same way that being inducted into the Harvard Varsity Club Hall of Fame is special. To even be mentioned in the same breathe as many of the great Harvard athletes who have been inducted over the years, including the 2004 inductees, is quite an honor. But as important and significant as this honor is on an individual level, it wouldn’t have been possible without a great deal of input and inspiration by a whole heck of a lot of people, way too many to mention here. But I would like to thank a few. First up are my parents and family, who always supported my academic and athletic endeavors, and who tossed in some help in the genetics department too. (Hate when mom is a better freethrow shooter than you are.) Thank you Tom, Linda and Ty! What I think always made Harvard a special place, on and off the gridiron, and what made grinding it out on the football field so much fun, and such a challenge, was the people. In this case, my fellow teammates. It isn’t often in life that you find yourself surrounded by a huge group of people dedicated and focused on achieving one common goal. Not only that, we lived together, ate together, sweat together, waited in line for Emo’s tape jobs together, crutched it across the bridge together, competed against one another in practice, fighting for a chance to get on that field on Saturdays and knowing that once Saturday did come it was one-for-all and all-for-one! They made my experiences at Harvard so memorable. Afterall, football is arguably the ultimate team sport, so quite naturally all of them have such a hand in an award like this. So I’d like to salute all of the teammates I had during my four years at Harvard, and thank them for all the unforgettable moments, the triumphs, the setbacks, the laughs and the heartbreaks. And oh yeah…as our man in Costa Rica brought back to the forefront of my memories…the 1987 Ivy League Championship. I would be remise not to mention a very special person who actually taught me the finer points of this sport, a sport which I’ve come to love and cherish, so much in fact I spend every Sunday afternoon and Monday Night during the NFL season in a television truck trying to capture the essence of what football really is for the folks at home. He showed me that football was a thinking man’s game. (Given this fact I’m still surprised we don’t win the Ivy League title every year!) He is of course Joe Restic. He opened my eyes to so much football, and along the way helped mold a young athlete from Crown Point, Indiana into the man he is today. I took Joe’s Multi-Flex offense to Italy and Spain after I graduated, and had great success teaching his system to the players with whom I coached and played. “Ace Left 2 Mo 318 Combo Option” became “Asso Sinistra Due Mo Opzione Combo Destra”. Sometimes in Joe’s meetings I think I would have understood the Italian version with more ease. Mo Frilot ’89, who played and coached with me in Spain, and I used to break down 49ers film in the early 90’s when the West Coast offense was at the height of it’s success. Truth be told, we were surprised to discover the West Coast offense is but a fraction of the Multi-Flex. Joe, we were 48-1 during my four years in Spain, and lost the first one. Not a bad system! Again I’d like to thank the Harvard Varsity Club for bestowing upon me this great honor. And I’d like to congratulate all my fellow inductees to Harvard’s Hall of Fame.